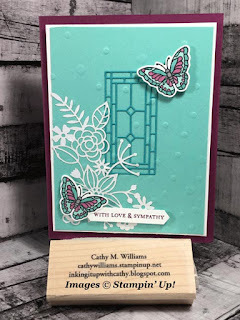 Last week I showed you a couple of projects using the Beauty Abounds and coordinating dies from the new Occasions catalog so I thought I would share a card with you using the butterflies from the Painted Glass stamp set in the annual catalog. Have you figured out where I got the white floral die cut from? No, it isn't from an actual die - it is from the Delightfully Detailed Lasercut paper. I just cut a section from the solid piece. Your Tip of the Day is one that I have shared several times - make sure to place double sided adhesive sheets to the back of the pieces that you are cutting out with the Stained Glass framelits. 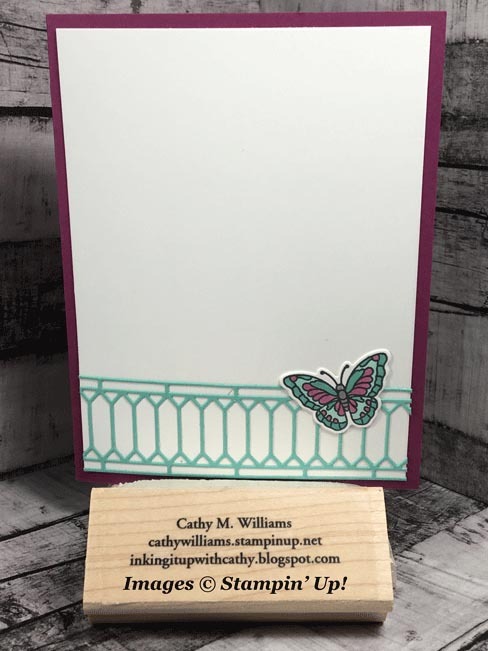 For the piece cut from the Delightfully Detailed paper, place some liquid glue on a silicone mat and smear it around and then place your piece into the glue to get some on the back.